Salad as a main course is a tricky thing. The thought of it immediately conjures up visions of dressing-soaked lettuce, sad chicken, and limp toppings. Slapped together haphazardly with little love, it’s never my first choice when eating out. At home, it’s a different thing altogether. A little care and good ingredients can make a side dish that steals the show or a main course that satiates even the hungriest diners. 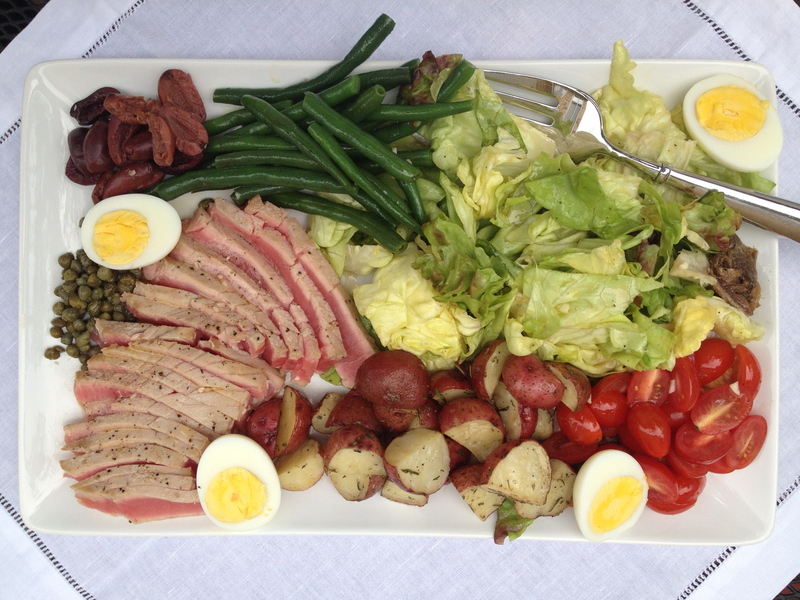 This recipe for salade niçoise makes one of those salads. For those looking to pull together a dinner salad in minutes this isn’t the salad for you. 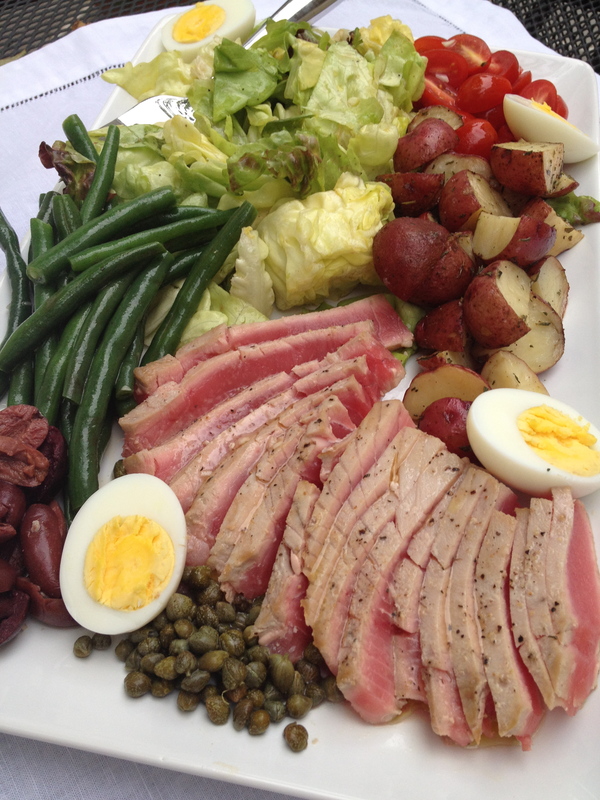 Salade niçoise has a bad name, because the time hasn’t been taken to make them right. Just ask my husband who reeled back in horror at the announcement of what we would be eating – don’t worry he recovered enough to have a second helping. It’s a worthy salad for sure, but it requires love and a little effort to make it spectacular. Fortunately, effort does not mean complicated. Salade niçoise couldn’t be easier to make. Treat each ingredient with the utmost care and the salad will be memorable. What does that involve? Potatoes are roasted to golden crispness, haricot verts are blanched and shocked to al dente perfection, and tuna is seared to your desired level of doneness. All of the ingredients are tossed, individually, at the last possible minute in a homemade vinaigrette. A serving platter is then assembled so that each diner can make the salad to their tastes. I’ve made several variations of this salad and you should feel free to do the same. While I love the sophistication that seared tuna adds, canned tuna may be substituted. If using canned tuna, I urge you to buy tuna packed in olive oil. Usually hidden on the very bottom shelf at the grocery store, it’s worth seeking out for the extra flavor it imparts and I promise the additional fat won’t hurt you. If using canned tuna, assemble the salad as I suggest in the variation included in the recipe below. Canned tuna just doesn’t have the same dramatic flair on an assembled platter as seared tuna but the variation still offers it some pizzazz. Preheat the oven to 400 degrees. 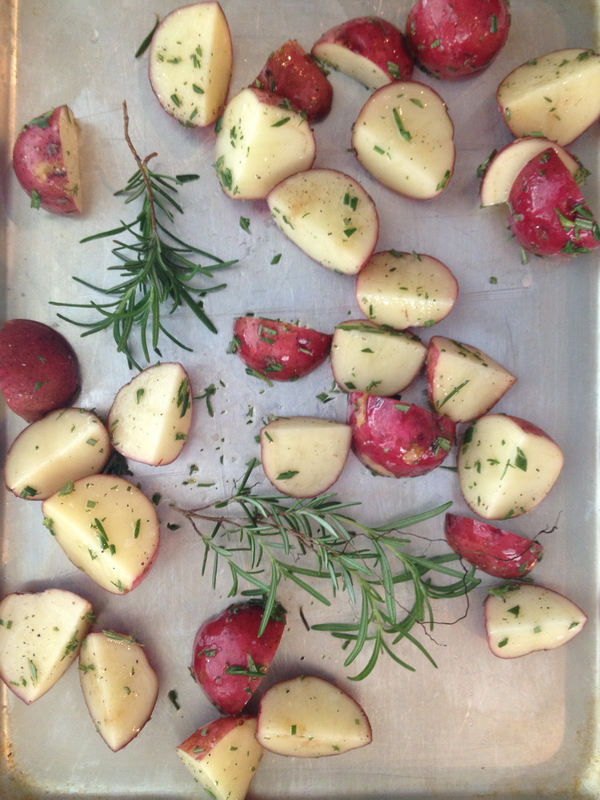 In a small bowl, toss the quartered potatoes with the ½ tablespoon olive oil, minced rosemary, salt, and freshly ground black pepper. Spread the potatoes on a baking sheet and bake for 25 minutes or until tender and browned, turning the potatoes after 15 minutes. Remove the potatoes from the oven and let cool. Place the eggs in a medium saucepan and cover with water. Bring the water to a boil. Cover the saucepan and remove from the heat. Let the eggs sit in the water for 15 minutes. Gently crack the eggs (roll the hard-boiled egg gently along the counter while pressing down) and then peel them. Half each egg lengthwise and set aside. Heat a large skillet over medium high heat. Once hot, add a film of olive oil (about 1 tablespoon) to cover the bottom of the pan. 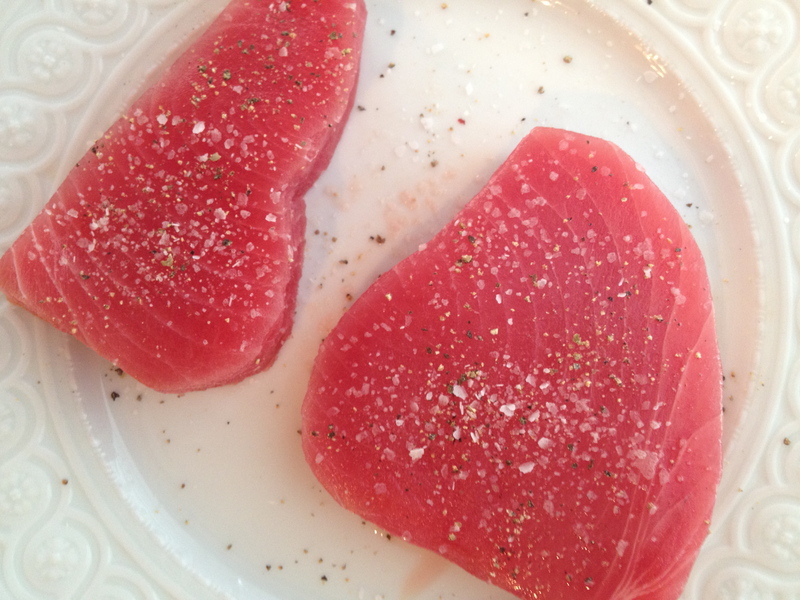 Pat the ahi tuna fillets dry with a paper towel and season generously with salt and pepper. 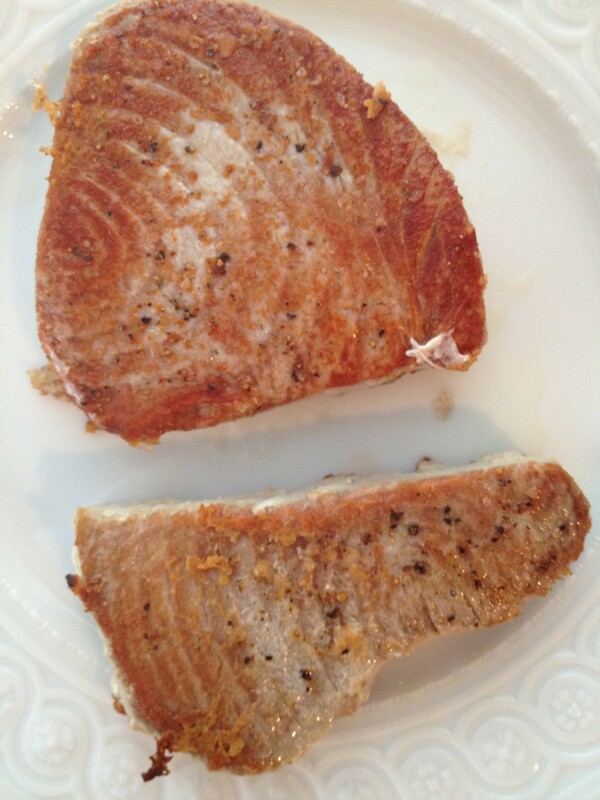 Add the tuna fillets to the skillet and sear for 1 to 2 minutes per side to desired doneness. Remove the fillets from the heat and set on a plate to cool. Thinly slice the fillets. Fill a large pot with water and salt it generously. Bring the water to a boil. Meanwhile, fill a large bowl with ice and water to make an ice water bath. Add the haricot verts to the boiling water and cook for about 4 minutes or until just tender. 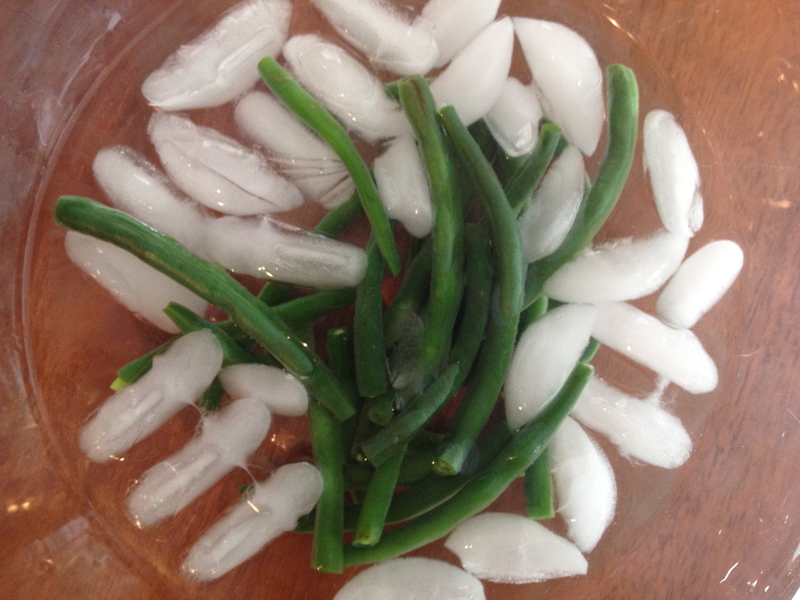 Strain the haricot verts and place them in the ice water bath. Once cool, remove the beans from the ice water bath and drain. If you have not already done so, prepare the remaining ingredients for the salad. To make the vinaigrette, combine the minced garlic, Dijon mustard, and red wine vinegar in a small bowl and whisk to combine. Slowly add the extra virgin olive oil, whisking constantly. Season the vinaigrette to taste with salt and freshly ground black pepper. 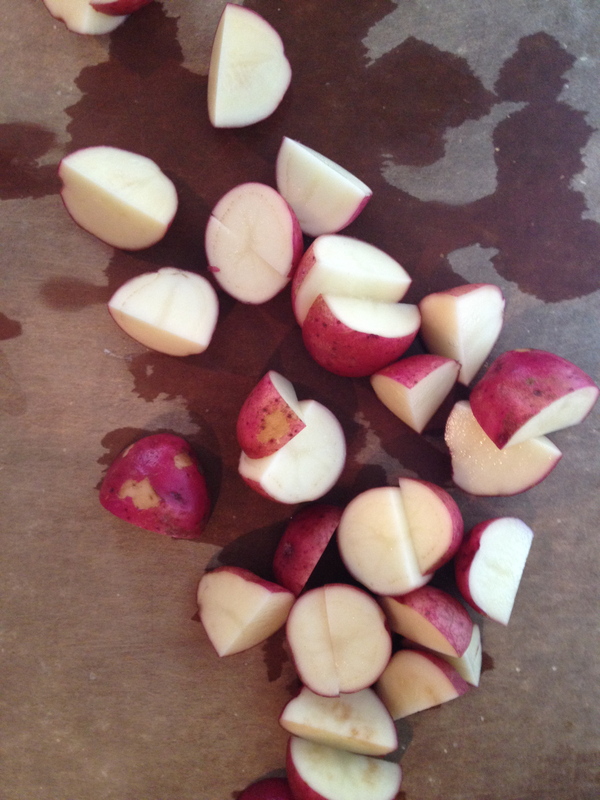 Use 1/2 tablespoon of the vinaigrette to dress the potatoes. Set aside. If using canned tuna, see the variation below. Otherwise, continue with the recipe. 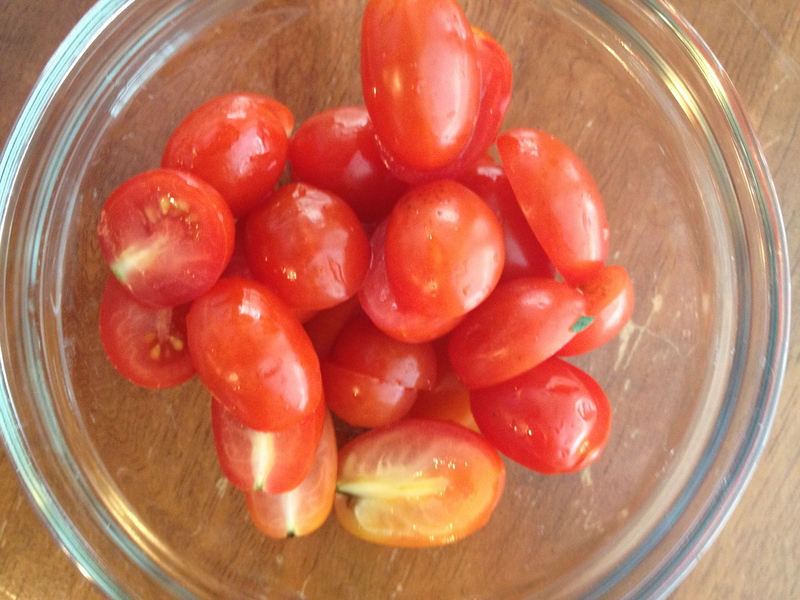 Use another ½ tablespoon of vinaigrette to dress the grape tomatoes. Set aside. 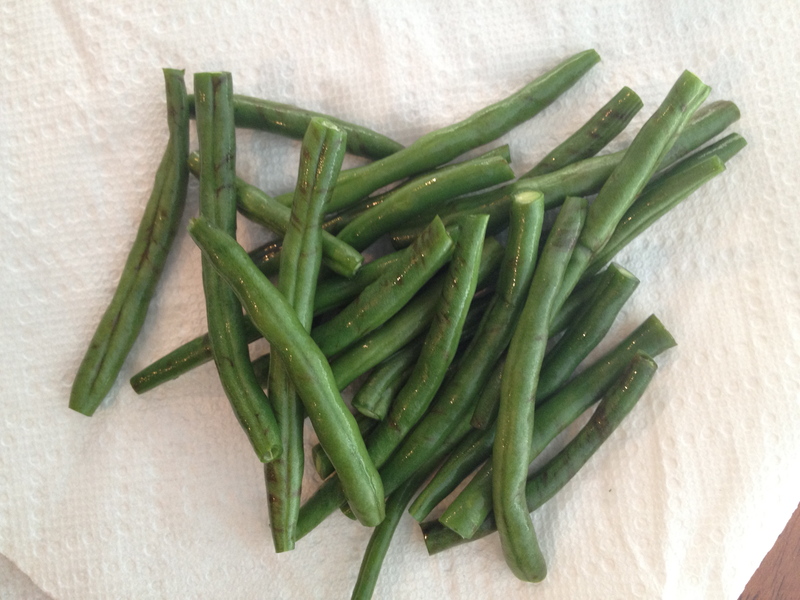 Use ½ tablespoon of vinaigrette to dress the haricot verts and then set them aside as well. Place two tablespoons of the vinaigrette in the bottom of a large bowl. Add the lettuce and toss to coat. On a large serving platter, arrange the lettuce. Place the sliced ahi tuna near the lettuce. Place the remaining ingredients around the lettuce and tuna in a decorative manner. Drizzle a little dressing over the sliced tuna. Serve at once with any leftover vinaigrette. *Variation if using canned tuna: Dress the potatoes as instructed above. In a large bowl, combine the haricot verts, halved grape tomatoes, olives, and capers. Use 1 tablespoon of the vinaigrette to dress these ingredients. Gently toss the tuna chunks in another 1 tablespoon of vinaigrette. Place about 2 tablespoons of vinaigrette in the bottom of a large bowl. Add the lettuce and toss to coat. Add additional vinaigrette if needed. Spread the lettuce evenly on a large platter. Sprinkle the lettuce with the roasted potatoes. Sprinkle the haricot verts mixture over the potatoes and lettuce. Top with the tuna chunks and place the halved hard-boiled eggs around the edge of the platter. Sprinkle the salad with the anchovies or serve on the side. Serve immediately.